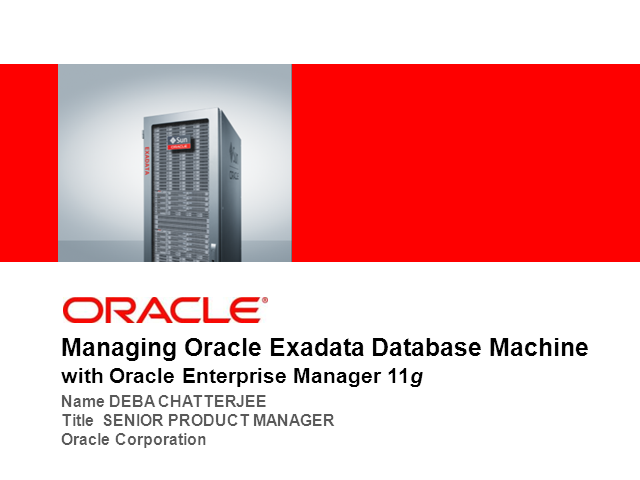 Register today and unlock the potential of Oracle Exadata for your enterprise. All Webcast attendees will receive a complimentary copy of IDC’s "Exadata Exceeds Expectations." capabilities for resource management including: Hadoop integration, topology-aware scheduling, and on-demand connectivity to the cloud. Oracle Grid Engine is entering a new chapter in its life as a key solution within Oracle Enterprise Manager product family. Join us for an engaging discussion about the latest capabilities as well as the product's new road map. IT organizations make significant investments in infrastructure technology to improve the performance and efficiency of their datacenters. However, without the right management solution in place, many of the expected benefits never materialize. In this session, you’ll learn how to maximize the value of your infrastructure investments with a new, unique converged hardware management approach with Oracle Enterprise Manager Ops Center. • How Ops Center maximizes the performance, availability, security, and manageability of your infrastructure assets. • How Oracle delivers a unique integrated management capability across your entire datacenter – from application to disk – to reduce costs and increase datacenter efficiency. Enterprise IT must constantly evolve to respond to rapidly changing business requirements and new technologies. Cloud computing promises to accelerate that evolution with new capabilities such as self-service, pay per use, elastic scalability, and efficient management of physical and virtual environments. What is different about cloud computing? What are the key enabling technologies? What is the role of management systems for cloud computing? This session explores how enterprise IT can evolve toward a cloud computing model, building on a foundation of grid computing, virtualization, and management automation. Rex Wang is Vice President of Product Marketing at Oracle where he leads go-to-market planning, sales enablement, marketing and demand generation for cloud computing, grid computing, virtualization, operating systems, management systems and enterprise architecture. He joined Oracle through the acquisition of Sleepycat Software, where he was the Vice President of Marketing and led marketing, product management and partner development. Prior to Sleepycat, Rex headed Product Marketing, Strategic Marketing and Alliance Marketing for Openwave Systems. Before that, he was VP Product Marketing at Confer Software and a management consultant for CSC Index. He holds a BSEE degree from Caltech and MSEE and MBA degrees from Stanford University. Learn how you can ensure application quality and performance with Oracle Application Quality Management solutions with Oracle Enterprise Manager 11g. Learn how you can automate your functional and regression testing, automate your load and performance testing, and manage your overall test process with Oracle Application Testing Suite. Join us for a live Webcast with Mary Turner, Research Director at IDC and Steve Wilson, Vice President of Product development at Oracle, for a discussion on emerging automation and integrated management requirements facing datacenter management teams, with a focus on Sun environments. In this webcast you’ll learn how Oracle addresses many of the top challenges facing DBAs today. Challenges ranging from performance management to ongoing administration, we’ll show you how the advance features of Oracle Database 11g along with Oracle Enterprise Manager allow you overcome these challenges and transforms your IT organization into a strategic business service. Today many IT organizations are faced with constantly changing IT environments and growing data center complexity. With hundreds of critical databases and multiple business applications to manage, how do you keep everything in compliance and manage change with confidence? Oracle Real Application Testing provides a cost-effective and easy-to-use solution for assessing the impact of changes on production Oracle Databases. The Management Pack for WebLogic Server models and monitors Java EE and Web Services applications enabling users to quickly identify bottlenecks, performance trends, and overall application efficiency. This pack also automates the time-consuming and often error prone process of installing, patching, and managing the configurations of Oracle Fusion Middleware software and its underlying operating system and hardware. In this presentation, we review the key solutions that comprise Oracle's unique top-down approach to Application Performance Management. These solutions deliver the ability to proactively monitor the health of all application processes from an end-user perspective and drill down into the components-including the underlying middleware and databases, that cause the application disruptions. This approach enables customers to reduce complexity and increase efficiencies in their IT environments and optimally run their enterprise applications. During this webcast you’ll hear from Oracle experts how unauthorized configuration changes are a leading cause of unplanned downtime, impacting your IT and business productivity as well as revenue. Learn best practices and strategies so you can avoid the pitfalls and deliver higher quality services while lowering your IT management costs. Whether you are a customer attempting to access an e-commerce site, or a manager at the other end charged with keeping the site’s applications performing flawlessly on a 24x7 basis, you know that there are always going to be glitches lurking. The best way to mitigate these issues is through effective monitoring, testing and quality assurance. A new survey of 526 managers and professionals finds that Web application issues are an all-too-common problem, with at least three out of 10 saying they have experienced problems personally as end-users on a weekly basis, and also dealt with issues as IT/application managers. However, even at the busiest e-business operations, there is too little monitoring, testing and quality assurance to reduce or mitigate the prevalence of Web application errors. The survey, among application managers at a range of companies, was conducted by Unisphere Research, a division of Information Today, Inc., in partnership with Oracle Corporation. Survey respondents included members of the Oracle Applications Users Group (OAUG) and readers of Database Trends and Applications (DBTA) magazine. The survey, conducted in March 2009, was announced via an email notification to the OAUG membership and DBTA readership lists, which directed participants to a Web-based survey instrument. Oracle Enterprise Manager's unique top-down approach to application management enables customers to reduce complexity and increase efficiencies in their IT environments and optimally run their enterprise applications. Oracle Enterprise Manager achieves this through an unrivaled blend of broad application management and quality assurance solutions with deep management solutions for Oracle technologies including Oracle packaged applications, Oracle Fusion Middleware, Oracle Database and Oracle VM.